Not long ago I had the privilege of being a teacher chaperone for a group of American eighth graders on an exchange trip to southern France. Students spent two weeks living with a French family, fully immersed in French cuisine and culture. Each morning we’d gather for an informal debrief where students would chatter excitedly about their experiences the day before. I watched their confidence swell as they met new challenges each day. I felt so fortunate to work in education, where effective teachers know that personal growth depends on leaving one’s comfort zone. I never intended to be a teacher. As a college student I excelled in reading and writing. I had a healthy sense of adventure and curiosity about the world. But, more than anything, joining the Peace Corps was a way of putting off making any serious decisions about my life. A month after I graduated from college, I found myself a wide-eyed, apprehensive Peace Corps Volunteer in Albania. It was 1995, shortly after elections had ended the most isolationist, repressive communist regime in all of Europe. After a crash course in Albanian language and a little bit of teaching practice, I was posted to a small town and started my new job as a high school English teacher. It was a fascinating, transitional time to be in Albania, and my experiences immediately began to spark a desire for personal growth. Justin Parmenter was a secondary education Volunteer in Albania from 1995 to 1997. In Albania, I learned what I was capable of: grading papers by candlelight and bathing in a bucket when utilities failed, learning to start a fire in the wood stove in my freezing classroom and how effective a piece of sheepskin was for erasing the plywood blackboard. I learned about generosity at the hands of my impoverished friends — like Luli, who would cook me a magnificent dinner while I tutored her daughter Irena in English, then sit cracking walnuts with her bare hands while I ate so I could leave with a snack for the road. Most of all, I learned that life could be difficult and inspiring at the same time. When my Peace Corps service ended and I returned to the U.S., I found that desire to live outside my comfort zone was still very much alive. Months later it took me to Istanbul — this time all alone. Though life as an English teacher in big city Istanbul was very different from that of rural Albania, there were some similarities. I was greeted with kindness and curiosity and dove into studying the language because I knew my life depended on it. I learned to navigate that enormous, fascinating city, came to appreciate Turkish language and culture and fell in love with my future wife, Arzu. Eventually I found it was time for me to return to school myself. I enrolled in Northern Arizona University’s Peace Corps Fellows program, which required that I teach two years on a Native American reservation while earning a master's degree and teaching certificate. My first job teaching in my own country was in Whiteriver, Arizona, with a 99 percent Native American student population. In many ways, this teaching job was much harder than the work I’d done in Albania and Turkey. The red carpet treatment I had enjoyed overseas was missing. Students struggled with absenteeism and substance abuse at a very early age. On a regular basis I felt uncomfortable, and that feeling led me to try new solutions. I discovered that my most effective tool in Whiteriver was relationship building. I started a Saturday fishing club, commandeered a school bus and invited my most challenging students to spend Saturdays catching trout and eating sandwiches on the shores of the high country lakes. Getting to know my students in that setting helped me understand their challenges and, in some cases, helped me motivate them at school. The reservation was a difficult place to work, but teaching there gave me insights that still serve me today. After a few years in Arizona, my wife and I relocated to Charlotte, North Carolina. Initially I worried that working in an urban school would lack excitement, but then I got a job at Waddell Language Academy. From kindergarten, students at this magnet school are immersed in Chinese, Japanese, French or German language and culture. They take exchange trips overseas where they are able to apply their language skills in a real world setting and form lifelong friendships with peers in other countries. It’s a rare opportunity to work in a public school that helps American children achieve very Peace Corps-like goals of working to understand other cultures and promote better understanding of Americans as well. Working in such a stimulating school environment has encouraged me to stay open-minded about how I teach. This approach, along with having amazing colleagues to learn from, has helped me to develop classroom practices that are highly engaging for students. Last year I was fortunate to be named a finalist for Charlotte-Mecklenburg Schools Teacher of the Year. When I think back to those early days, looking out my broken classroom window up at Mount Dhembeli while smoke curled out of the wood-burning stove behind me, I can see that early desire to live outside my comfort zone has been the catalyst that made it all possible. It all began with taking a risk and embarking on the adventure of a lifetime with the Peace Corps. 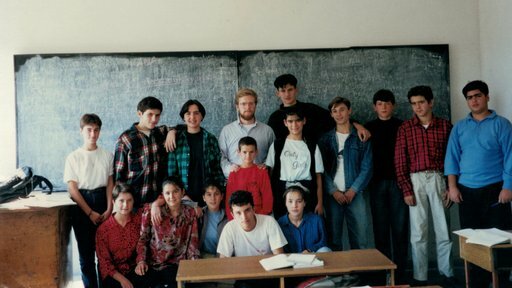 Justin Parmenter was a secondary education Volunteer in Albania from 1995 to 1997. After teaching stints in Istanbul and on the White Mountain Apache Reservation in Arizona, he settled down in Charlotte, NC. In 2016 he was a finalist for Charlotte-Mecklenburg Schools Teacher of the Year. Connect your learners to the world.